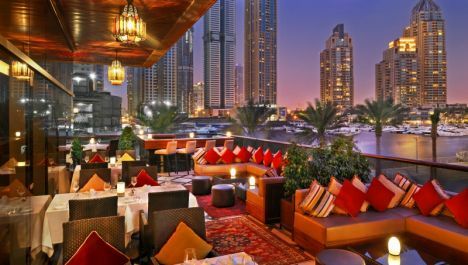 If you are looking for a splendid dining experience in Dubai where you can get Middle Eastern atmosphere, then head straight to Ottomans Restaurant that is located in famous accommodation facility, Grosvenor House in the locality of Dubai Marina. This restaurant’s culinary forte is its traditional Arabic and Turkish dishes, which are superb in taste and great in quality too. However, this wonderful journey does not end here, as its luxurious interiors and amazing outdoor seating facility gives customers mesmerizing views of Dubai Marina. In brief, Ottomans Restaurant is an ideal venue to enjoy both terrific ambiance and scrumptious food. The menu of this fine dining restaurant is based on rich Arabic flavors and influences of Turkish traditions that give guests a multi-zest journey. So now people of Dubai do not need to go anywhere else, as they can relish rich flavors of Mediterranean under one roof. Wide assortment of alcohol, live music and outdoor seating makes this venue more alluring, as these romantic settings will easily take the attention of the guests away from all the worries of the world. Click here, to see the menu of Ottomans Restaurant. This restaurant serves dinner from 7:30 pm to 1:00 am between Tuesday and Sunday and remains close on Monday. Grosvenor House, Dubai Marina, Dubai, United Arab Emirates. Ottomans Restaurant has no metro station within a walking distance of 2.5 kilometers, therefore best option to get near this site is by car or bus. 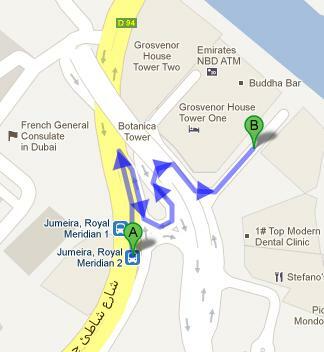 Bus numbers 8 and F37 serve Jumeira, Royal Meridian 2 – Dubai bus stop that is just 450 meters away from the Ottomans Restaurant in Grosvenor House. This makes it a walking journey of about 5 minutes, if a bus user heads in the north direction on Jumeirah Beach Road from this bus station, then take a sharp right turn, before making a slight turn on the left side. After which bus user will make right turn twice, one after the other, before making the final turn on the left side in order to get to the destination that is located on the left side few meters away. View map for directions.